Coast Hotels quietly offers up an great transfer bonus today! 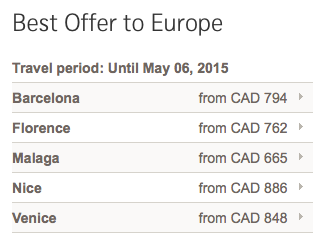 Coast Hotels is offering up to 75% off their regular conversion rates to Aeroplan Miles. This offer runs until April 30th and is a great deal if you happen to be sitting on 12,500 points as that will net you 50,000 Aeroplan Miles!!! Find all the details here. Here is another Rexall coupon for you. 80 bonus AIR MILES Rewards Miles when you spend $40 or more by March 19. Print the coupon here. In the bonus offers section check out WestJet Rewards' route launch bonus for their new Fredericton - Toronto route.